One of the fastest growing and most exciting clay target games is definitely Sporting Clays. Sometimes called the “golf” of shooting games, “courses” are set up for squads of 1–6 people to move through. Oftentimes, these courses can be modified on a regular basis to keep things more interesting. 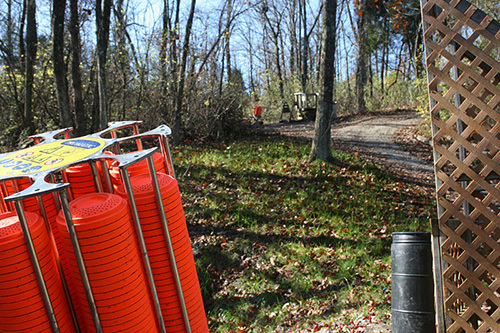 The Middletown Sportsmen’s Club offers a full Sporting Clay course with up to 15 stations available. Shooters move between numbered stations and can select a 50-target round, or 100-target round. Again, it’s a lot like playing nine holes of golf, or a full 18 holes – depends upon the time you would like to invest. There is a “cage” or shooting area at each of the numbered stops on the course. Each stop will have two traps that release clay birds that mimic the real flight patterns in the wild. Participants rotate the order at each station, with the fist person being allowed to see a flight path (or pull) to prepare for the specific setup. Squads work their way through the course until everyone has met their target limits. primers and shot in sizes 9, 8, 8.5, 7, 7.5, 6, 5 and 4’s.